Last week I pulled up my green bean plants, weeded the garden patch, re-marked the rows, and planted a new batch of seeds. Beans plants will keep producing until the frost, but generally, the subsequent blossoms after the first are not as abundant. More blossoms equals more beans, and vise-versa. So, I decided that since my beans were early this year, I could replant after the first blossoms did their thing, and get another good crop of beans well before frost. I am back to watering my patch of dirt, and watching with bated breath for new plants. 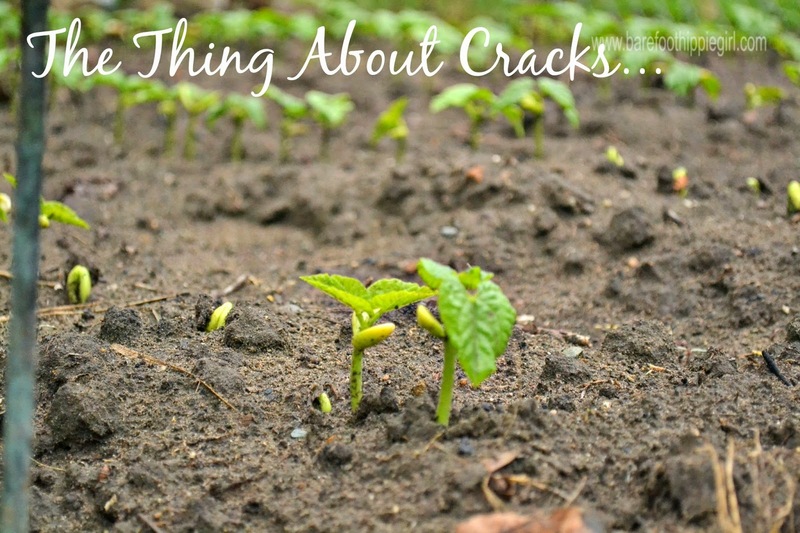 Have you ever noticed that before the seeds spring above ground into tiny plants, the dirt cracks? Maybe it is the mole(s) that are reigning freely in my yard. But, I am pretty sure it is also the seeds doing their work. 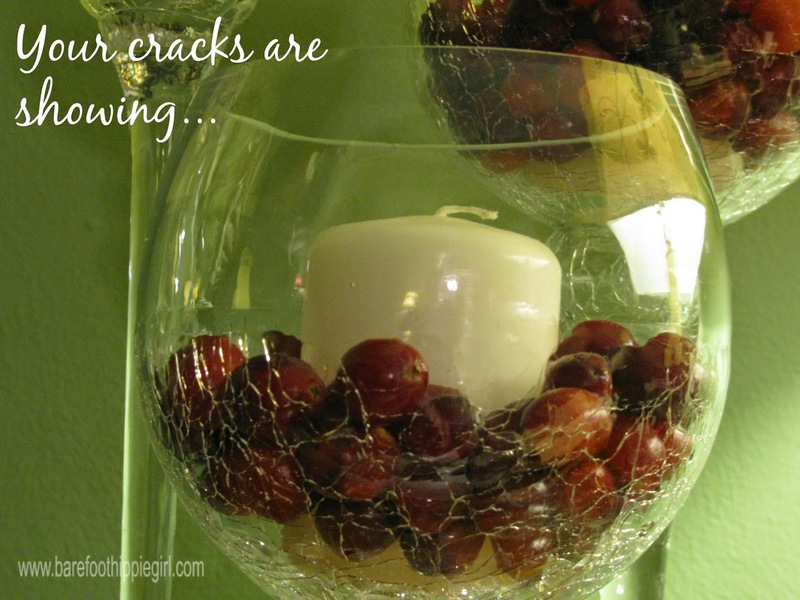 Cracked glass is a decorating style. A thing of brokenness becomes a thing of beauty. Cracks in a fertilized and incubated egg means a baby chick is about to appear. Cracks in sidewalks reveal where the trees are flexing their roots. Searching for water and stability and nutrients. Cracks in plaster means that your house is a house. It moves with life. It isn't (necessarily) falling down around you ears. Cracks in dishes mean they are used. They aren't just sitting on a shelf. An empty cicada shell always has a crack in the center, and that crack is a sign of growth. Outgrown skin left behind. Same bug emerges from the shell-only bigger. Cracks indicate life and movement and growth. Cracks in my facade of perfection and strength and togetherness. Cracks in my relationships. Cracks in my heart. Cracks show vulnerability, but not necessarily weakness. Cracks can indicate where repair is needed. Some glue, some shoring up, some time. Cracks show growth and stretching. Sometimes the cracks show where I've become inflexible like old rubber. Cracks point out where I need softening. But, not all cracks are meant to be repaired. Cracks often need to be left for good to come out. That something that won't pop through as long as we stay whole. Where are your cracks showing?